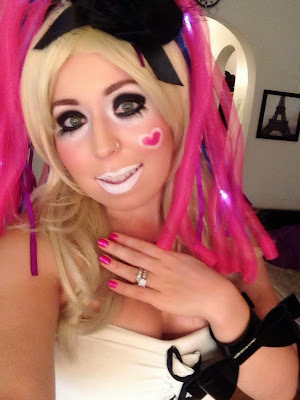 ♥ Sweet Glamour Makeup ♥: GANGURO HARAJUKU MAKEUP LOOK TUTORIAL FOR HALLOWEEN! GANGURO HARAJUKU MAKEUP LOOK TUTORIAL FOR HALLOWEEN! I was inspired to do this look from the "Ganguro girls" that are popular in Tokyo. It's an alternative,playful look to the pale skin and light makeup look that is highly preferred in the traditional asian culture. I darkened my eyes,bronzed my skin and did stark white circles around the eyes,and used the white as lipstick as well. I added a heart and some bottom eyelashes to exaggerate the look. Hope you enjoyed this look and stay tuned for more upcoming looks!